An infant is brought to the clinic with a rash on his neck. The child is otherwise healthy with no other systemic abnormalities. 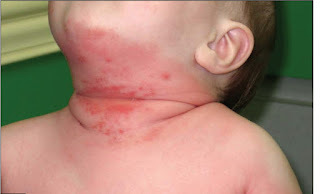 On examination the affected part of the skin was red and consisted of small vesicles and papules. Candidal intertrigo affecting the neck. Etiology: It involves the opposing and rubbing surfaces of skin where sweat cannot evaporate easily. Thus, such areas provide warmth and moisture that is ideal for growth of Candida albicans. Management: Its management mainly involves topical application of antifungal powders as clotrimazole and trying to correct the predisposing factors. Oral fluconazole in 3-6 mg/kg for a week or longer is helpful in extensive cases. Weekly doses are recommended in recurrent cases.